Life is short so don't take yourself too seriously- Even on your wedding day. Or maybe especially on your wedding day? Anyway, this laid back and delightfully sardonic couple implemented that idea throughout their planning process until they said "I do." And it worked... wonderfully! For instance, Ryan turned around to see Dana dressed as a cat (yes, the paws were included) during their first look. A surprise planned perfectly, and also intelligently, to loosen up the mood in a time when waterworks make their uncanny debut. During the ceremony, Dana's gymnastics students tumbled down the isle in matching tees reading "Ring Security" to bring the couple their wedding rings. This fun couple also incorporated their family in the reception entertainment! Mother of the bride on vocals and guitar; Uncle of the bride tearing up the dance floor in an energetic frenzy. Dana and Ryan killed it on their wedding day and they allowed us to capture one of the most interesting weddings in our experience! A: Ryan stalked me while working for MLB Network.... just kidding. We would say hi to each other in the halls at work and Ryan finally ended up Facebook messaging me. I had no clue who he was. I work with 95% males. Didn’t plan on dating anyone I work with. But we met up and the rest is history. A: We've been dating for four years. 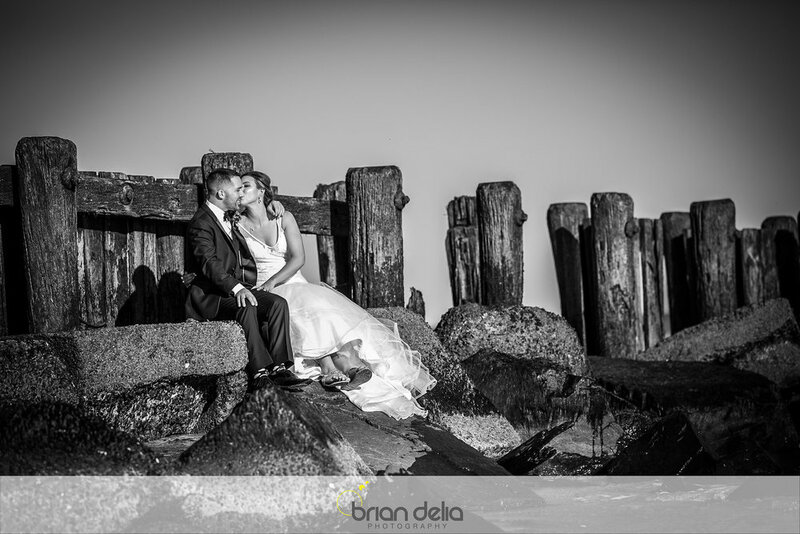 A: Ryan proposed to me at the Wooden Jetty where we took pictures on our wedding day. He had all of my closest family and friends come to LBI and they wore shirts that spelt out “Will you marry me?” Even his godson was the question mark. Really amazing. A: Fun...? I didn’t really do a theme. Beachy? Who knows. A: It was the craziest, funniest, happiest day of our lives.